Space maintenance can be defined as the provision of an appliance (active or passive) which is concerned only with the control of space loss without taking into consideration measures to supervise the development of dentition. 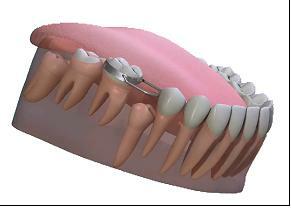 Space maintainers are appliances used to maintain space or regain minor amounts of space lost, so as to guide the unerupted tooth into a proper position in the arch. It should maintain the entire mesio-distal space created by a lost tooth. It must restore the function as far as possible & prevent over-eruption of opposing teeth. It should be simple in construction. It should be strong enough to withstand the functional forces. It should not exert excessive stress on adjoining teeth. It must permit maintenance of oral hygiene. It must not restrict normal growth & development and natural adjustments which take place during the transition from deciduous to permanent dentition. It should not come in the way of other functions.